Inspect your yard and home thoroughly. If the answer to any of the following questions is yes, you may have a rodent problem. Do you find rodent droppings around dog or cat dishes or pet food storage containers? 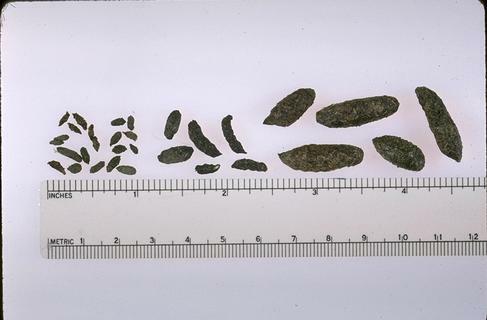 Droppings of house mouse (left), roof rat (center), and Norway rat (right). Photo by William Gelling. Have you found remnants of rodent nests when dismantling your firewood stack? Does your dog or cat bring home dead rodent carcasses? Have you found rodent nests behind boxes or in drawers in the garage? Are there smudge marks caused by the rodents rubbing their fur against beams, rafters, pipes, and walls? Some rodent infestations can easily be managed by homeowners. Below are a few steps to manage rodent pests. Note that the ORDER in which these steps are taken is critical! The stocky Norway rat builds burrows along building foundations, beneath rubbish, or in woodpiles. Indoors they tend to remain in basements or on the ground floor. Roof rats are agile climbers with a tail longer than their head and body. They usually live and nest above ground in shrubs, trees, or dense vegetation. Indoors they favor attic spaces, walls, false ceilings, and cabinets. 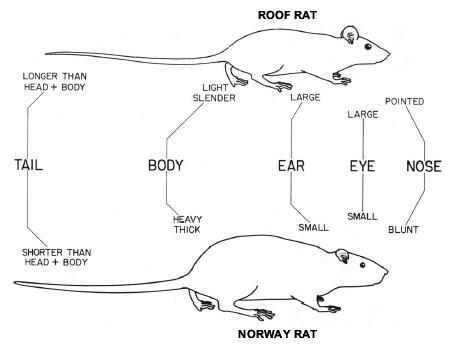 Use the graphic to help determine what kind of rodent you have. This may not be easy, and you may need to consult with a professional. From Bjornson, B. F., and C. V. Wright. 1960 (revised). 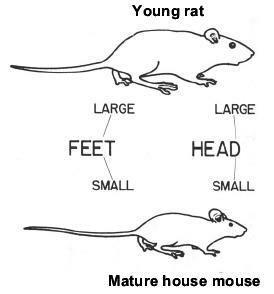 Control of Domestic Rats and Mice. Center for Disease Control, USDHEW, Public Health Service Pub. 563.
wool, metal flashing or plaster patching kits as appropriate to close off these areas. Snap traps are recommended. Always use mouse traps for mice and rat traps for rats. Depending on the kind of rodent, you will have to select the right placement of traps and you might need to place food on the trap and not set the trap (also known as pre-baiting) for two to three nights in a row. Bait effectively with peanut butter and oats. To prevent rodents from dying in inaccessible places (wall voids, crawl spaces, etc. ), never use bait indoors, and only use bait outside if you are certain that no rodents can get into the house! Baits are not very effective if other food sources remain. Make sure to carefully follow all label instructions on bait products, and use bait stations as required. For more information on trapping and using poison bait, please visit the UC Integrated Pest Management website. keep dog droppings picked up and properly disposed of.